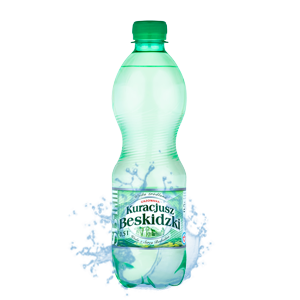 Sparkling water Kuracjusz Beskidzki is recommended to persons in every age in the every diet. It is recommended after a heavy job or a physical exercise. It perfectly quenches thirst. The bottle is perfectly designed to be taken into the hand. 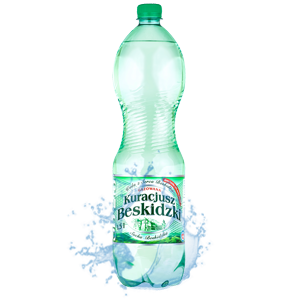 Water Kuracjusz carbonated is recommended after a hard work. It perfectly quenches thirst. The bottle is perfectly designed to be taken into the hand. It tastes the best after cooling till the temperature of 5o. The spring water from the source Kuracjusz is on the slope of the mountain Jasień in Sucha Beskidzka. It is recommended after a hard work. The composition of the water makes that regualar drinking stimulates water and ion management of organism. Water perfectly influances digestion and cleans organism from toxins. The little shape of the bottle can be carried with ease.